Around noon on a Saturday in February at the Southside Occupational Academy in West Englewood, the school’s hallways were filled with urbanites clutching pamphlets about raising bees and goats and ducks. The occasion was the sixth annual Urban Livestock Expo, where residents curious about urban agriculture from all over Chicago could learn from organizations such as Advocates for Urban Agriculture, Chicago Honey Co-op, and Chicagoland Chicken Enthusiasts. In the auditorium a crowd listened attentively as the manager of a beekeeping supply store explained the best ways to monitor a colony’s health during Chicago’s bitter winters, while down the hall a classroom played host to a goat and its many admirers. But most eye-catching of all were the chickens. Plump hens nestled in a cage, chicks just days old frolicked under a heat lamp, and roosters strutted around sporting hairstyles to rival those from the eighties. Judging by the turnout at the expo, interest in keeping urban chickens is high. Attendees formed lines to pet the many breeds of chickens, hold baby chicks, and admire cartons of multicolored eggs. Burke is the owner of an animal health products company, but at her home on a 2.5-acre plot an hour’s drive northwest of Chicago, she nurses her real love of keeping horses and “a nice selection of chickens.” In 2014, she started, mostly for fun, a side business called Urban Chicken Rentals. For $110 a month customers across the city and the surrounding suburbs get three hens at their egg-laying prime, a coop, and all the food and supplies that the birds require. Some chicken renters are surprised to learn that roosters are not necessary to get a steady supply of eggs, as hens produce up to an egg a day as part of their ovulation cycle. Renting appeals to some wannabe chicken keepers as an easy, commitment-free alternative; in addition to the economic and logistical burden of keeping chickens long term, owners may also find themselves in the unwitting position of becoming a chicken ambassador to their neighbors, and sometimes to the city, says Boyd. Boyd is the reason the Chicagoland Chicken Enthusiasts network exists. The loose network of current and prospective chicken keepers shares tips and policies on its website and listserv, which currently totals over 700 members. It formed in 2008 after Boyd helped beat back legislation on the move to the city council that would have banned urban flocks. She recognized the need for outreach to counteract the misinformation regarding urban chicken policies and practices circulating in the public, in the government, and even among chicken owners themselves. In 2010 the group launched the first “Hen-apalooza,” which became the annual Windy City Coop tour, to open up what chicken keeping looks like to the broader public. Jenny Addison showed off her own backyard chicken setup on the coop tour in 2016. Addison, who grew up in rural Northwest Connecticut with chicken coops, rabbit hutches, and ducks in the backyard, now keeps six hens in the brightly painted backyard coop she built in Woodlawn. She prefers to hatch the chicks herself from fertilized eggs, which she gets from friends who also keep roosters, and smuggles them under one of her hens when they occasionally try to incubate their unfertilized eggs—a process referred to as “going broody.” The hen’s body temperature increases, which she uses to sit on her eggs and keep them warm. For those who want to hatch their own chicks but lack the cat burglary skills of Ethan Hunt or Jenny Addison, there is always the artificial incubator. Addison owns one as well: a square Styrofoam box about two feet wide with a low-wattage heating coil and a thermometer to monitor the temperature. The work is meticulous, requiring constant vigilance to humidity and temperature for the length of the incubation period, which lasts twenty-one days—but the results are clearly rewarding: Addison estimates that she has hatched between twenty-five to thirty chicks at her home over the past four years. One of the most important responsibilities of the chicken keeper is to provide a sturdy coop to secure against city predators, such as Peregrine falcons, red-tailed hawks, and foxes. DeeAnn Larson of Bronzeville upgraded to a converted armoire that she got for free from Craigslist after a raccoon killed a rooster and three of her hens last year. A good coop can be expensive, like the one Joe Olivier purchased secondhand for $500 after the 2016 “massacre” in his Irving Park backyard that took out two of his birds, which he blames on weasels or minks. Keeping a coop and run clean can be hard and dirty work. Chickens get sick, carry diseases like salmonella, and extra care must be taken during the cold months when owners worry about “winterizing” their chickens—protecting the coop from drafts and keeping drinking water from freezing. It can also be a hassle to drive the half hour from Woodlawn to get to Belmont Feed and Seed, one of the few places in the city that sells chicken feed and supplies. Chickens are also helpful composters, eating all sorts of kitchen scraps and producing waste that turns into a rich fertilizer for the garden. But one of the best perks of having chickens, of course, is the eggs. 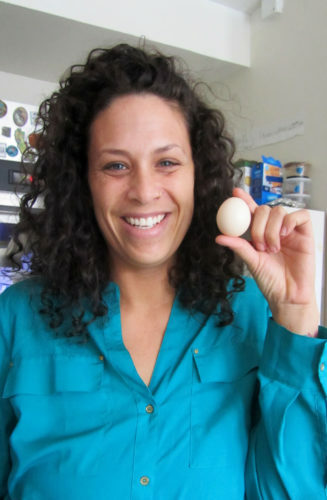 Larson describes the excitement she felt when her chicken laid its first egg: “I was a proud mama. I did a happy dance.” Larson’s eight-year-old daughter created a little nest for the egg and carried it around for a long time. In her backyard in Woodlawn, Addison hands over a freshly laid egg from its nest. Her six hens—of different breeds such as Plymouth Rocks, Chocolate Marans, and Easter Eggers—peck around for scraps at her feet. The egg is light brown and spotless and radiating warmth into the cool February air. In the eternal question of the chicken or the egg, maybe it’s not a bad idea to have both. Hi Tammy, Thanks so much for your detailed article! I would love to take all credit for ChiChickEns – but I just can’t. The reason the group exists — 10 years after launching with 45 people at our first workshop in 2008! 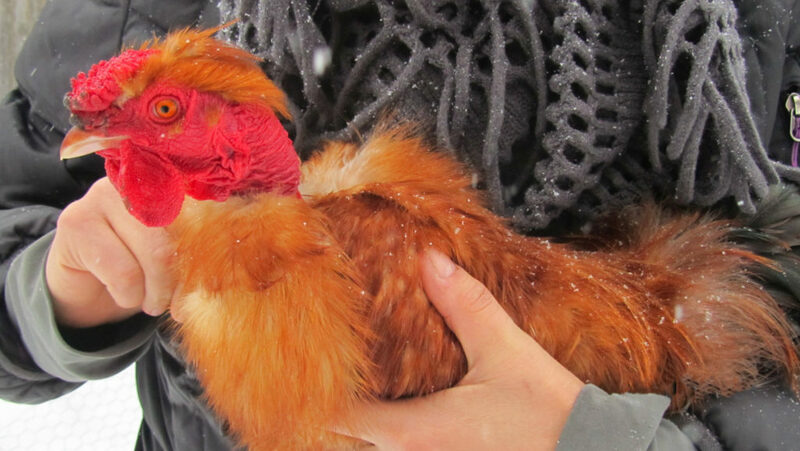 — is the enthusiastic, informative, slightly-obsessed keepers of backyard chickens (and other creatures) around Chicago. Moderating ChiChickEns is a pleasure because members are knowledgeable, generous, overall NICE PEOPLE – and also a tad zany. Some of those early members provided the info and inspiration to stop the ban on backyard chickens. Nearly 90 of them have opened their yards to the public for the Windy City Coop Tour – that’s devotion! Much credit is due to my employer Angelic Organics Learning Center for sponsoring ChiChickEns and my time to work on it. We welcome donations to keep it all happening: http://www.learngrowconnect.org. THANKS AGAIN and join us for the 2018 Windy City Coop Tour on Sept 15 & 16, expanding to include “Eco-Yards” with and without chickens.